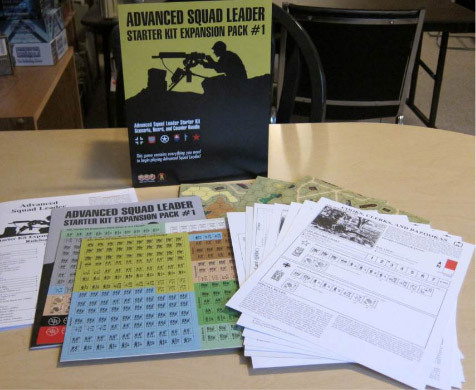 The Advanced Squad Leader Starter Kit Expansion Pack #1 (whew, let’s just call it EP1) is an odd duck. It is called an Expansion Pack, but it is not actually an expansion pack at all. Rather, it is a complete de facto ASL Starter Kit #4. Not a single counter or map or chart from the ASLSK is required to play this product; in this sense, it does not “expand” or “add on” to the ASLSK at all. It is entirely self-contained. Other than the lack of a box, the only thing that distinguishes this from any of the three previous ASLSK sets is that it does not add any new rules (though it does provide a corrected version of the ASLSK rulebook, with recent errata added). If someone put the contents of this product in the ASLSK3 box, a purchaser would probably be none the wiser; this is basically an alternative ASLSK3. The wisdom of this decision is somewhat debatable. EP1 is not only an alternative ASLSK3, but, in fact, it costs every bit as much as ASLSK3. While the advantage for a completely new player is that he can play this right out of the wrapper, the disadvantage is that, for non-new players, especially owners of ASLSK3, they will be purchasing components all over again, things that they already have. And one must assume that the majority of purchasers will not be using this product to enter the system (indeed, the very title of the product makes it likely that many potential purchasers will not even realize that they can do so). It also means that people who own the previous ASLSK products won’t get to use any of the maps or counters they have already purchased when playing this product. The rationale behind this decision was apparently because of the desire to entice people who may own one or two but not all of the previous ASLSK modules. But this just gets back to the questionable decision of making a series of three separate, entirely self-contained ASLSK modules in the first place, as well as the decision to continue ASLSK as a separate expanding product line rather than encouraging people instead to make the jump to full ASL. Will every future ASLSK product contain an ASLSK version of “ontogeny recapitulates phylogeny,” each product containing the essence of the earlier ones all over again? One could easily imagine, were this to be so, an ASLSK player accumulating a stack of rulebooks and charts that could be very high indeed. So, for someone completely new to ASL and ASLSK–someone unlikely to be reading these words–this product is indeed yet another way to get into the system, in addition to ASLSK1, ASLSK2, ASLSK3, and, of course, full ASL. 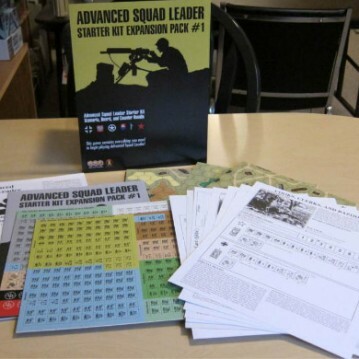 It provides all the rules and charts for ASLSK, as well as all the specific counters, maps, and historical notes to play the included scenarios. For people who already own ASLSK and/or ASL stuff, what does this product add? Well, as noted above, it does provide the latest version of the ASLSK rulebook. 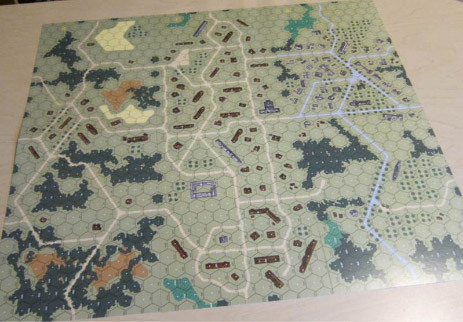 It also provides three new mapboards, though one will have to wait for future scenarios for them to be combined with previous ASLSK mapboards. These three maps are the only ones called for in the included scenarios. Board q is a semi-rural map, with a tiny wooden-building-ed crossroads hamlet in the middle. The buildings are small and spaced out. One one side of the hamlet are a mixture of thin woods, fields, and a hill. On the other, more interesting side of the hamlet, the terrain is more wooded, with a couple of small hills. For scenario designers, it is this side, hexrows r-gg, that may well be more useful. Especially with a few overlays to help it out, it could be a useful woods or jungle half-board. Board r, on the other hand, is undoubtedly the worst board of all the ASLSK boards released so far. Indeed, it could give almost any ASL board a run for its money as worst board in the entire ASL system. This is a “city” board, but a very unrealistic one. It consists largely of small wood buildings (one and two hex), widely separated, with open ground in between them. There are some places where terrain like this may have existed to some degree (the Warsaw suburb of Wola, perhaps), but probably not many. For a city board, it is amazingly unclustered and wide open. It just doesn’t have the feeling of verisimilitude that is important in creating a geomorphic mapboard. Board s is rather better. It is a “tale of two half-boards.” One half is mostly a mix of woods, open ground, and orchards, with a few buildings thrown in. The other half is a stone-building-ed crossroads village, one that conceivably could get quite a lot of use by scenario designers. It is certainly the best board in this product. It is frustrating that MMP’s map graphics cannot be consistent from one map to another. For example, in EP1, as with other ASLSK products, orchards are represented by 4 bizarre amoeba-like green shapes. In the other ASL boards, they are represented by (much nicer looking) 4 green circles. Why are there two different types of orchard art? Why is this not standardized? There are other inconsistencies, too. For example, the woods hexes in EP1’s Board q have no drop shadow, but the woods hexes in Action Pack 7’s Board 61–printed at basically the same time–have drop shadows. It is hard to understand why these inconsistencies exist at all. The product provide all the counters needed to play the included scenarios. This includes about a half-sheet of markers. In addition to these, there are 54 AFVs and Guns (12 British, 11 Italian, 12 German, 10 American, 4 Soviet, and 5 Axis Minor). Infantry and SW include 34 Allied Minor counters, 72 Italian counters, 34 British counters, 71 German counters, 73 American counters, 33 Soviet counters, and 45 Axis Minor counters. The British counters are only used to represent the Free French in this product. Because EP1 comes with no box, or even a ziplock bag, but is simply encased in shrinkwrap, purchasers will have to find their own way to store its components. The 8 scenarios represent a range of actions, including Finland 1942 (Soviets vs. Germans), Sicily 1943 (Americans vs. Italians [2 scenarios]), France 1944 (Americans vs. Germans, French vs. Germans), Poland 1939 (Poles vs. Slovaks [2 scenarios]), and Germany 1944 (Americans vs. Germans). Oddly, there are no East Front scenarios set in the Soviet Union; however, the opportunity for ASLSK players to play other nationalities more than compensates for this. The scenario set in Finland, S46 (Where the Winter Lingers), appears from the historical description to be a generic scenario that is not an actual recreation of a specific historical tactical event. If so, it is a shame that it would be included. Though most of the scenarios don’t have many SSRs, several of the scenarios have some very long SSRs (9+ lines long); these are usually due to attempts to recreate by SSR sections of the ASL rules missing from the ASLSK rules (such as offboard artillery or hidden units). S50 (N-463), named after a road in southern France, is an interesting scenario because it features the much-ignored 1st French Army in its fight to reach the Rhine through the Belfort gap in late 1944. The scenario features a German counterattack by elite forces supported by two Jagdpanzer Vs against the 9th Colonial Division and the 1st Armored Division. 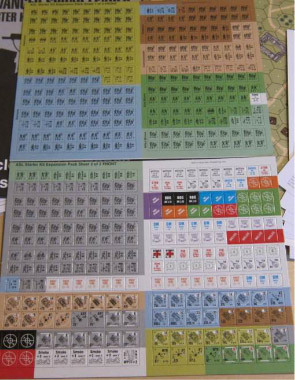 The defending French have 8 elite squads and a penny-packet’s worth of Shermans, as well as an AT gun. The (very lengthy) VC basically just say that the Germans win by being able to apply 21 FP points along a key road. Scenarios S47 (Not So Disposed) and S48 (Converging Assaults), both set in Sicily at the Gela beachhead, can be played independently or linked together for a two-part scenario, with some pieces carrying over from one scenario to the next. S51 (Enter the Young) depicts a strong American attack against a smaller but very nasty German force. S49 (Cooks, Clerks, and Bazookas) basically does the exact opposite. If there is such an audience as “dedicated ASLSK players” out there, then they will no doubt eat this pack up, as it adds 8 scenarios to what is, after all, at this point a fairly limited pool of ASLSK scenarios (about 1% of the ASL scenarios out there are ASLSK scenarios). The scenarios, though, are relatively few in number and many are not all that exciting. It might well have been more appealing for some would-be purchasers if it did not contain all the rulebooks and charts but were instead less expensive or had more scenarios. It is an okay product but it is hard to work up a lot of enthusiasm for it.